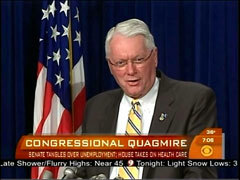 Reporting on Republican Kentucky Senator Jim Bunning blocking spending legislation over deficit concerns at the top of Tuesday's CBS Early Show, co-host Harry Smith proclaimed: "Congressional quagmire. Democrats blame one Republican senator for preventing thousands of federal workers from working." In a later report, White House correspondent Chip Reid continued to assail Bunning: "The White House is pointing its finger at a single Republican senator who they say is standing in the way of federal aid for hundreds of thousands of unemployed Americans....he is single-handedly holding up a routine piece of legislation." Rather than address Bunning's spending concerns, Reid declared: "Because of his objection, 2,000 federal transportation workers had to be furloughed without pay. 400,000 Americans risk losing their unemployment benefits over the next seven to ten days. And Medicare fees for doctors suddenly slashed by 21%." Reid briefly noted: "Bunning wants the Democrats to come up with a way to pay the $10 billion price tag." A couple clips were played of the Kentucky Senator voicing his opposition: "And I'm going to object every time because you won't pay for this....We cannot keep adding to the debt." Following Reid's report, Smith interviewed Democratic House Majority Leader Steny Hoyer and wondered if Bunning was really even allowed to oppose the bill: "Does he have a point, does he have a right to stand there in the well of the Senate and say 'you got to pay for this' or do you think he's out of line?" Hoyer pointed out: "Well, under the rules, he obviously is in the Senate, has the ability to do that." Smith went on to ask Hoyer about a possible scaled down version of health care reform, urging the Congressman to sell it to viewers: "Nancy Pelosi says there will be a smaller version of the health care bill that is going to be moving forward. If there is a single best selling point in it, what is it?" A headline on screen read: "House Dems On The Hot Seat; Obama's New Health Care Proposal Hangs In Balance." In a follow up, Smith observed that moderate Democrats and Obama adviser Warren Buffett are concerned about cost containment in the health care bill, asking Hoyer: "Is there any chance this moves back a little bit, that there's more agreement before this thing moves – moves forward?" In his final question to Hoyer, Smith fretted about the political fallout of Democrats passing unpopular legislation: "If you get this passed, are you – are you happy to live with this, this may cost you seats in the end come November." Hoyer replied: "we're prepared to go to the American public because we believe they support the individual elements in the bill."